On the face of it, buying shares in Saudi Aramco – the world’s largest oil company – is a no-brainer for any investor, even with the price of crude threatening to fall below $30 per barrel. But dig a little deeper and a potential IPO of Saudi Arabia’s wholly owned state oil producer comes with significant risks that could outweigh its access to the kingdom’s vast reserves of crude. The idea of listing Aramco has been muttered in the corridors of power in Riyadh for years, but these conversations may now be turning into concrete plans. Mohammed bin Salman – the influential deputy crown prince and favoured son of the king – told The Economist magazine on Jan. 7 that a decision to float the kingdom’s most valued asset could come in weeks. That has whetted the appetite of investors, but also raised questions about how a newly listed entity would split revenue from tapping into 18 percent of the world’s oil reserves with the Saudi government. Aramco’s original concession agreement dates back to its foundation in 1933 and the exact terms of the existing deal are unknown. Dependent on the oil and gas sector for 85 percent of its export earnings, Riyadh will be reluctant to allow Aramco to keep more income from crude for the benefit of shareholders. Potential investors will want to see how earnings are divided with the publication of a full balance sheet for a company that could easily command a valuation above $1 trillion, based on its current output of more than 10 million barrels per day of crude. There are also important questions over governance, and whether international investors will be allowed to buy shares in a listing. Last April’s decision to take the chairmanship of Aramco away from the oil minister Ali al-Naimi may help address the first concern, by reducing the ministry’s control. But even though the Saudi stock market has underperformed over the last year and is relatively small with a value of about 1.5 trillion riyals ($400 billion), any listing could yet be limited to local investors. Given many domestic investors are state pension funds, it would be a way for the state to maintain its grip. Aramco could be the biggest IPO ever attempted. Or it could just be a mirage. 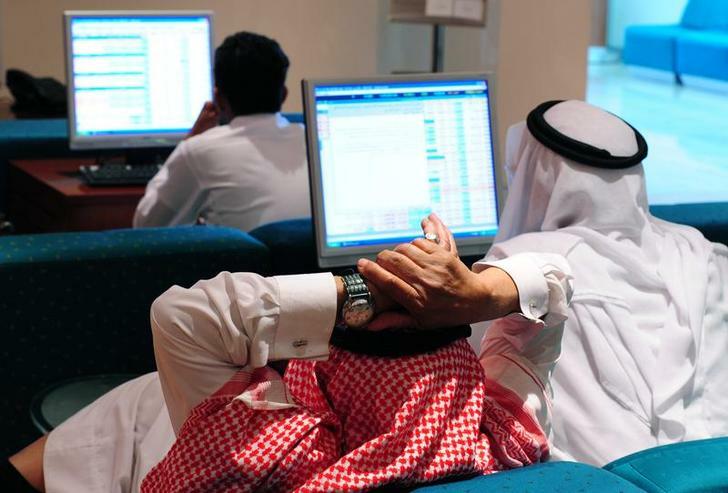 Traders monitor stocks at the Saudi Hollandi Bank in Dammam, 350 km (217 miles) east of Riyadh March 28, 2011. Saudi Arabia is considering selling a stake in Saudi Aramco, its national oil company, according to a Jan. 7 report in The Economist. The kingdom’s powerful Deputy Crown Prince Mohammed bin Salman told the magazine in an interview that he has held meetings about listing shares in the company on the domestic stock market. The son of Saudi ruler King Salman said any sale could include the core holding company responsible for the kingdom’s oil production or be limited to a stake in Aramco’s downstream refining unit. With its finances hit by collapsing oil prices, Saudi Arabia on Dec. 28 unveiled plans for cutting a record state budget deficit. Possible reforms include new taxes, fewer state subsidies and the sale of government-owned companies to private buyers.